ALBUQUERQUE, N.M. (KRQE) – Lowe’s grocery stores are giving shoppers in Albuquerque and Santa Fe some motivation to eat locally grown fruits and veggies. The new program called “double up food bucks” kicked off Wednesday. The dollar-for-dollar match allows shoppers to use their snap benefits to buy fresh New Mexico-grown produce for half the price, spending up to $25 each visit. 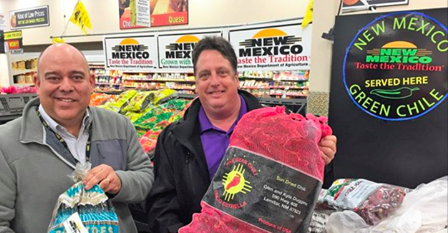 “Our family of New Mexicans, they get to eat healthier, better fresh local produce, and the farmers have somewhere to distribute their crops, we’ve committed to the farmers, we’ve committed to the community and this is going to be a year-round program,” said Michael Venticinque, a Lowes produce supervisor. The program is available at the Fourth Street location in Albuquerque and the “Food King” location in Santa Fe.